It's happened: winter is slowly setting in on Minnesota. Last week Saturday the yards and streets took on the familiar white layer of fresh snow. Within a few days the snow had melted, which was good - the abundance of fallen leaves on the grass dyed the snow a strange yellow color. It looked like packs of dogs descended upon the neighborhood and lifted their legs on every inch of snow. Hopefully everyone will rake up their leaves so that unfortunate discoloration doesn't repeat itself when another inevitable snowfall arrives. Yellow snow aside, I experienced a surprise flutter of excitement with those first flakes. My relationship with Minnesota winters is historically a tenuous one, but I feel differently this year. My body is healthier and stronger, cold weather doesn't seem like torture, and I'm actually looking forward to talking walks on bright winter days and hearing the crunch of snow underfoot. I just moved back into the Seward neighborhood of Minneapolis last week, my favorite neighborhood, and the beauty of this place in the winter is making me giddy. This is my third time living in Seward since moving to Minneapolis in 2004, and I feel like I'm returning home. Literally - I lived in a duplex directly across the street from 2005-2006 and lived in another duplex two blocks north from 2007-2009. Seward is the kind of neighborhood where people bike and walk all year round, where the ice rink in the park is regularly used, and where freshly made snow people line the front yards. The neighborhood is nestled between the Mississippi River and railroad lines, and the quaint houses reflect its modest, blue-color upbringing. My favorite food co-op is three blocks from my front door, bike paths abound, a community park and a Montessori school are on the other side of my block, and people wave when they pass each other in cars. It's wonderful. Once the snow falls again, I'll take some photos. The cool temperatures of November in Minnesota are being tempered by the coziness of the neighborhood - it just makes me feel good inside. I love my new home, feel a great connection with my new housemates, and feel cradled by the familiarity of of the neighborhood. To amp up the cozy feeling (and further persuade my housemates to love me), I decided to make chocolate chip cookies. It worked. My housemates declared that these are some of the best cookies they've ever had! 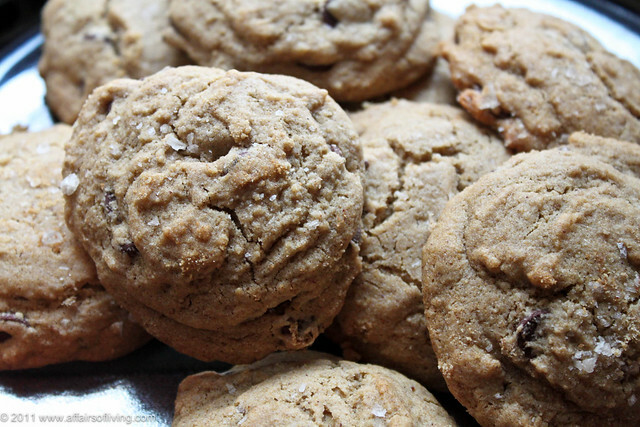 The combination of the sweet and spicy mesquite flour with chocolate and a sprinkling of crunchy sea salt flakes makes for an addictive combination. They are slightly chewy and crisp around the edges. And not only that, these little gems are gluten-free and sweetened with stevia and honey instead of cane sugar. I did, however, use both butter and eggs in the recipe, so they aren't quite as allergy-friendly as some cookie recipes I've made in the past. I haven't tried subbing coconut oil or shortening for the butter or using an egg-replacer for the eggs yet, so I'm not sure how that would work. If you try it, please let let me know how it turns out. I biked in to work this morning and relished in riding the familiar trails and feeling the cool air on my face. I felt strength in my legs and gave thanks for my body with each pedal. And I know that the cookie I ate before work this morning helped power my way. This recipe is included in Simply Sugar & Gluten-Free's Slightly Indulgent Tuesday for 11/29/11. These cookies feature mesquite flour, an aromatic and flavorful flour made from the beans of the mesquite pod. Mesquite grows in the southwest portion of the United States, and the flour has a wonderful cinnamon-cocoa-coffee flavor. Find mesquite flour online or at well-stocked specialty or natural foods stores. If you don't want to include it, substitute with an equal weight of sorghum flour, but keep in mind the flavor of the cookie will differ. Another flour note: these cookies also use sweet rice flour. Sweet rice flour is a flour made from sweet rice, a short-grain rice that is very sticky and is often used for puddings. Sweet rice flour is also called glutinous rice flour because of the sticky texture - but don't be concerned by the name! Sweet rice flour and glutinous rice flour are totally gluten-free and safe for people with celiac, wheat allergies, or gluten-intolerance. It is a wonderful flour because it helps to maintain moisture and hold things together, and adds a great chewy quality to baked goods. It is also a great thickener for sauces. I buy sweet rice flour at my local Asian market - a one pound bag of flour is only $.99. Because of its unique qualities, sweet rice flour is very much unlike white rice flour or brown rice flour, and they can not be substitutes for each other. I prefer to measure my ingredients by weight, which is a more accurate and much easier (and creates fewer dishes to wash). I did, however, include approximate volume measurements for those of you that haven't yet jumped on the food scale bandwagon. Place flours in a large bowl and whisk together briskly to introduce air and make light and fluffy. Add baking soda, baking powder, and salt, and whisk to combine. Set aside. In a large bowl, cream butter until smooth with a mixer or hand-mixer. Add eggs and beat until just combined, then maple syrup, and vanilla and continue to beat until just evenly combined (the consistency will look a little goopy, that's okay). Gradually add dry ingredients and beat until well-incorporated. Fold in chocolate chips by hand until evenly incorporated. Cover dough and let sit in the fridge for 1 hour. The flour will absorb some of the moisture and yield a thicker dough and yummier cookie. AFter an hour, pre-heat oven to 350º F and remove dough from fridge. Line cookie sheets with parchment paper, and scoop out dough by the heaping tablespoon, leaving 2-3 inches between cookies to leave room for spreading. 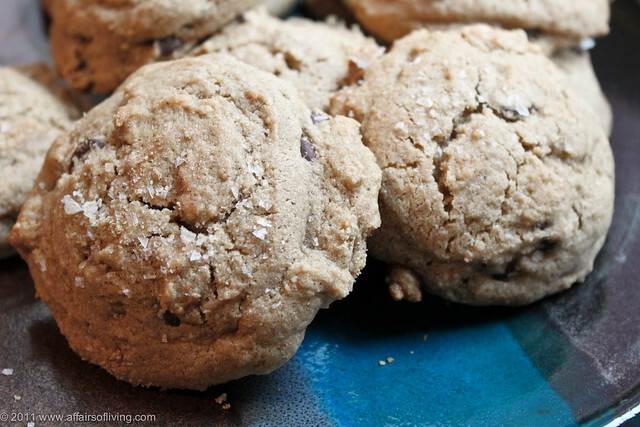 Sprinkle cookies lightly with sea salt flakes, making sure each one gets a healthy dose, then place in the oven. Bake for 14 minutes, or if baking two pans at a time, bake for 7 minutes then rotate pans between the racks and bake for another 7 minutes. Cookies should be firm around the edges but still slightly soft and puffy in the middle - they will deflate as they cool. Also, the cookies will not brown very much, so don't wait for them to be golden. Remove cookies from oven, and let cool for 5 minutes on the pan before transferring cookies to a cooling rack. Cool completely before eating - they are best when cooled. Store in an air-tight container for up to 3 days. Newer PostRecipe: Who needs potatoes when you have Parsnip Apple Mash?